1st October 2017 – will see changes to the National Quality Framework come into effect. SSBT will host a free information workshop on the 28th September 2017 at 4:30 pm at their Burwood Campus. Meet Rhonda Livingstone – National Education Leader ACECQA. The workshop will cover changes, which will affect the various Quality Areas linked to the NQF. 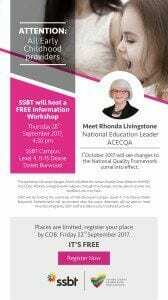 ACECQA’s, Rhonda Livingstone will take you through the changes and be able to answer any questions Educators or Directors may have. SSBT will be hosting the event at their Burwood Campus (Level 4, 11-15 dean Street, Burwood). Refreshments will be provided after the event, attendees will be able to meet Rhonda Livingstone, SSBT staff and fellow Educators and Directors. Places are limited, to register your place please email alberto@ssbt.nsw.edu.au by COB. Friday 22nd September 2017.